​I have received conformation that unfortunately I did not make it as one of the six selected riders to take part in the Step Up To Gold scheme for this year however I was delighted to be selected as one of three reserves. With over 50 applicants to choose from it is a pleasure for me to be recognised as one of the talented riders that shone out from the rest especially when the horse I was riding is one that I have produced myself from a novice. 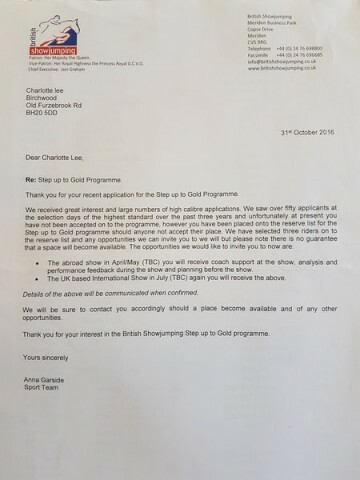 I may not have been selected but this is not the end of the road for me wanting to make the Step up to 1.40m level. I will continue to work hard at home and take learning from my first experience of jumping 1.40m in Bonheiden, Belgium this year.